Between 2013 and 2018, roughly 7GW/12GWh of energy storage was deployed globally, with a compound annual growth rate of 74%, WMPR said. However roughly half of this total was installed last year alone, WMPR added, indicating the start of a rapid growth in demand for storage applications. "These developments have shifted the minds of global regulators, policy makers, grid operators, asset operators and developers, in terms of how energy systems can be balanced," said WMPR research director Ravi Manghani. "Market structures have generally struggled to keep up with the pace of this technology, illustrated by the limited number of revenue streams available to appropriately compensate storage," he said. Much of the outlook is centered in the US and China — much like the forecast for the wind sector. Roughly 54% of the GWh deployed capacity will be seen in these two markets up to 2024, WMPR said. The analysis also predicts the shift from short-term storage to longer duration systems that can replace diesel, gas peakers and fuel imports. "We expect renewables-plus projects to become a popular trend through 2024," said Rory McCarthy, a senior research analyst for WMPR. This is especially true for solar-plus-storage projects, as the requirement for clean and dispatchable renewables is widely accepted. "In investment terms, we estimate the cumulative global energy storage market — defined, in this context, as total system capital expenditure on electrochemical and electromechanical energy storage systems, excluding pumped hydro — to grow six-fold to a total of $71 billion by 2024. $14 billion of that total will be invested in 2024 alone. 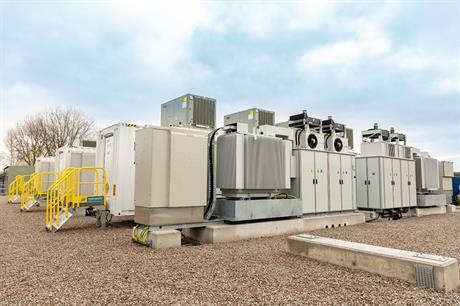 "Energy storage will become a necessary technology to enhance system flexibility and enable clean, rapid system balancing, while de-risking ever increasing intermittent assets and portfolios," McCarthy added. This week, lawmakers in the US introduced legislation to extend the 30% investment tax credit to standalone storage projects, which "would immediately boost investment", according the US Energy Storage Association. BloombergNEF also recently found the levelised cost of energy for lithium-ion batteries fell 75% since 2012.